Formulated from a series of soluble dyes in a superior shellac solution. These inks can be applied with brush, pen or airbrush and are widely used by illustrators, designers, calligraphers and artists. Brilliant colours, fast drying and water resistant, fully intermixable, easily diluted and have excellent adhesion to most sized surfaces. The coloured inks are not lightfast except for the metallic colours and black and white. All the colours are water resistant except for Liquid Indian ink. Winsor & Newton Drawing Inks have been used by illustrators since their introduction in the 1890's, where the main requirement is brilliance of colour. Today they are formulated from a series of soluble dyes in a superior shellac solution. These inks can be applied with brush, dip pen or airbrush and are widely used by designers, calligraphers and artists as well as illustrators. 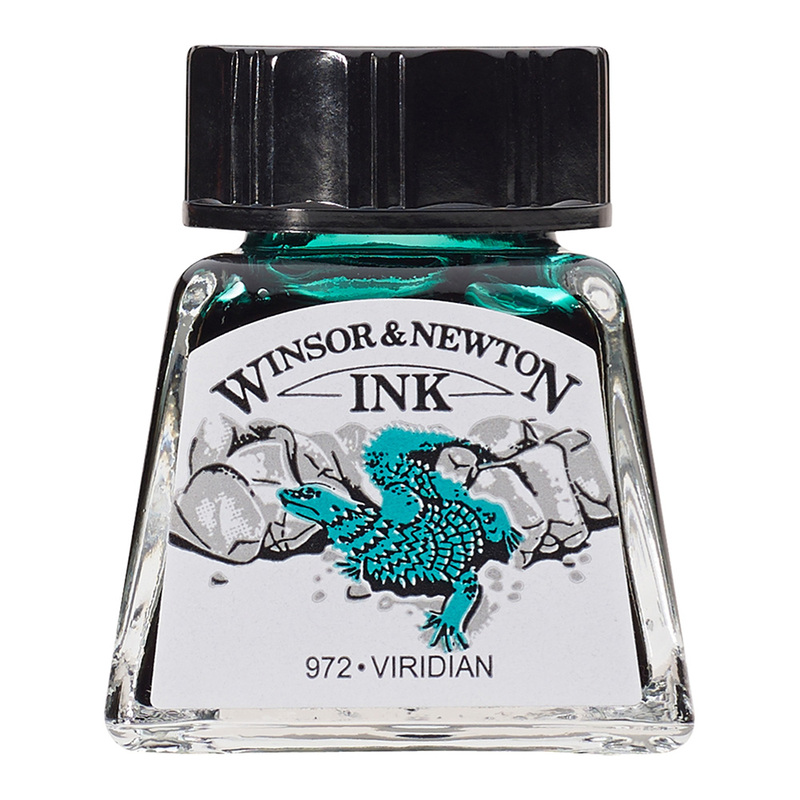 The range comprises 26 colours including Liquid Indian Ink, a water based solution of traditional chinese stick ink. This is the standard lettering ink used by calligraphers (which is not water resistant). The full range of 26 Drawing Ink colours are available in 14ml bottles, each with their own uniquely designed box. Blacks, Gold and Silver are available in 30ml bottles. Black Indian Ink (the 'spider' design) is available in 30ml with a dropper lid and 250ml bottles. Excellent product. Colours bright and clear.